The home search that follows displays current listings of homes for sale in Circle C Ranch in Southwest Austin. If you see a home that you would like to view, or if you want a NO Pressure Tour of Circle C Ranch Homes, call Jim at 512.913.1557. Neighborhood Location: The large Southwest Austin real estate development called Circle C Ranch is situated mostly in an area bounded by Mopac (Loop 1) on the east, SH-45 on the S, FM 1826 to the W, and W. Slaughter Lane on the N.
Scroll down to see more info on the Circle C Ranch development. The following table is intended to give you a 8-year snapshot of real estate & home sales activity in all sections of Southwest Austin's Circle C Ranch subdivision. Home buyers have a wide range of options in Circle C Ranch -- in price, in size and in home style. These Circle C Ranch real estate stats are from the Austin Board of Realtors, 1/1/2011 - 12/31/2018. 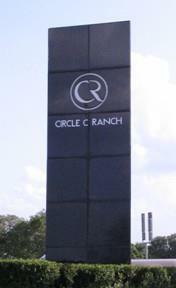 Circle C Ranch is a large, master-planned neighborhood located on some prime Southwest Austin Texas real estate. As evidenced by the number of sales in the past few years, it is very popular and attractive community for many families. The area’s first homes were built in 1988. In early January 2016, Standard Pacific Homes (now CalAtlantic Homes) is still building new homes in Circle C.
North of W. Slaughter Lane: Park Place, Vintage Place, Circle C North. In early 2013, Streetman Homes is adding a new, 22-home development (Barstow Court) between Circle C North and W. Slaughter Ln. Enclosed by FM-1826, W. Slaughter Lane, Mopac and SH-45: Circle C South, Circle C West/Hielscher (Alta Mira, Fairway Estates, The Enclave, Enclave Estates), Muirfield, Park West (Garden Homes), etc. South of SH-45: At the SH-45 intersection with Escarpment Blvd., Standard Pacific Homes is developing a subdivision called Avana-Esquel*. This work was begun in late 2011). In the latter part of 2012, Streetman Homes (now CalAtlantic Homes) began a new development at the Southeast corner of Mopac and SH-45. Called Greyrock Ridge*, this neighborhood will have around 387 homes when it is completed. South of SH-45 at the SW corner of Circle C Ranch: The Meridian at Circle C development is completed, but is not officially a part of Circle C Ranch. Circle C offers its residents the beauty of the Hill Country with its many trees, green areas, and scenic views (over 460 acres of dedicated park lands). It is a great area for outdoor enthusiasts! Residents of Circle C Ranch have easy access to the Mopac Expressway (Loop 1). The neighborhood and offers a short, though sometimes crowded, commute to downtown Austin. Circle C residents are near a number of major shopping centers. The newest center is Parkside Village, which is located at the SW corner of W. Slaughter Lane and Mopac. Grey Rock Tennis Club, located at the site of the Grey Rock Golf Club. The club is a private one that offers lighted courts (8), pro shop and more. Circle C Swim Center, with the only heated, outdoor, Olympic-sized pool in Central Texas. A new Circle C pool and community center were opened in 2012 at the corner of LaCrosse Ave. and Sprice Canyon Dr.
Grey Rock (formerly Circle C) Golf Club, a semi-private club with a challenging 18-hole layout. All but the 9th hole of the front nine is located on the north side of SH-45. Some homes in two gated neighborhoods, Muirfield and Fairway Estates, are built on lots along these front nine holes. This course is now owned by the City of Austin. Escarpment Village shopping center that includes an HEB grocery store, Wachovia Bank, Starbucks, Waterloo Icehouse and more. Parkside Village: The newest of the shopping/retail facilities in Circle C Ranch. See the note above "Prime Location." Parks: The Circle C residential areas are intermingled in some 462 acres of the Circle C Park. This dedicated parkland is mostly natural, with bike and hike trails, but two areas have been developed for the use of Circle C residents. (1) Metropolitan Park, just past Escarpment at 6301 W. Slaughter Lane, has numerous soccer fields that serve area children in the South Austin Youth Soccer Association. The park also has an oak-shaded children’s playscape and picnic area, a basketball court, a Frisbee golf course, and hike and bike trails. (2) The Veloway is a 23-foot wide, over 3 miles long, asphalt-paved track built on more than 100 acres of parkland. It serves Austin bicycle and rollerblading enthusiasts exclusively. No vehicle or pedestrian traffic is allowed on the Veloway. The trail, located on La Crosse opposite the Lady Bird Johnson Wildflower Center, is open from dawn to dusk. Students living in the various sections of Circle C Ranch attend public schools operated by the Austin Independent School District. Since the Circle C neighborhood is so large, elementary students attend one of four different schools, and middle school students attend one of two schools. Parents should verify the schools for a particular home address in Circle C Ranch with the Austin ISD.